Born in Tokyo in 1928, Hidetaka Nishiyama began his karate training in 1943 under Gichin Funakoshi, founder of modern Shotokan karate. Two years later, while enrolled at Takushoku University, he became a member of the university’s karate team and in 1949, its captain. 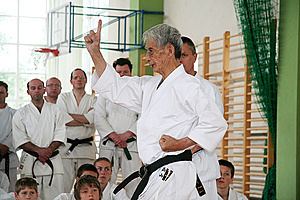 He co-founded the All Japan Collegiate Karate Federation and was elected its first chairman. Then, in November of 2000, the Emperor of Japan awarded Nishiyama with “Kunyoto” - Fourth Order of Merit - and was decorated with “Zuiho-sho” - The Order of the Sacred Treasure - for his many contributions to promote Japanese culture through Traditional Karate. He passed away on November 7, 2008 in Los Angeles, California. He is survived by his wife, Yohko, and daughters Yumi, Amy and Nami. Today his name continues to be a force in the Traditional Karate world as the very high standards he set for himself and his students continue to live on in Traditional Karate “dojos” around the world.